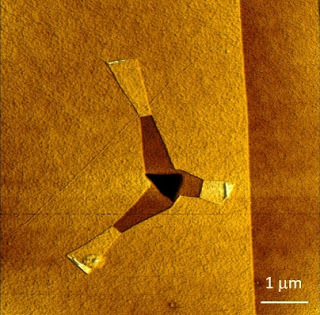 Graphene, the weird material that already has all kinds of odd and useful properties, has a new one; it can rip itself into ribbons. James Annett discovered this by accident. Graphene is a material made out of carbon atoms, just like diamond, but also like graphite, the stuff that’s inside your pencil. But the carbon atoms are arranged in a special way. Graphene is a material that’s only one layer of atoms thick, and because of that, the atoms are arranged in a special pattern which gives graphene all kinds of special qualities. Just like diamond is really strong and transparent because of the way the carbon atoms are arranged inside of it and the graphite inside your pencil is really soft and black, graphene is extremely strong, about two hundred times stronger than steel, and it’s really good at conducting electricity. These things, combined with the fact that graphene is transparent, makes graphene a very useful material in among other, electronics. The screen of your smartphone has, for example, tiny copper wires woven into it. These copper wires could be replaced by wires made out of graphene, which would make your screen bendable, as graphene is really strong and could withstand the pressures of being bend way better than copper, which could easily break. 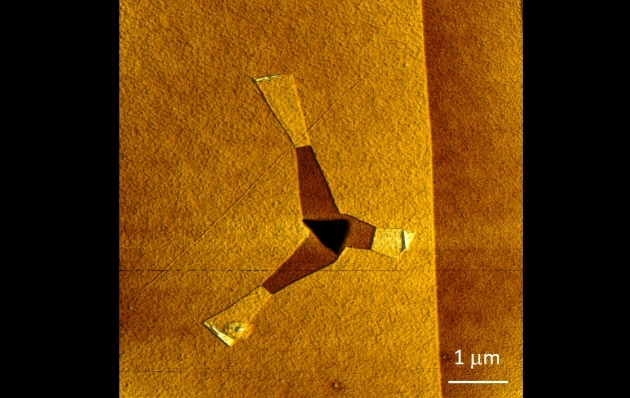 But now, scientists have discovered a new property of graphene; it rips itself into ribbons when you poke a hole in it. This odd property was discovered by two scientists in Dublin. James Annett was doing experiments on the friction characteristics of the material when he accidentally poked a couple of holes in the graphene sheet he was using. After that, he saw with a microscope that tiny ribbons had formed around the holes. Together with Graham Cross, he also found an explanation for the ribbon-forming; multiple layers of graphene are more stable than just the one layer. So if the graphene gets the chance, it rolls up like a poster that has spent too much time in his tube. The bindings that hold the carbon atoms together are very strong however. Because of this, you need to wiggle around a little in the hole in the graphene sheet to make the bindings looser, and longer ribbons form when the temperature is higher, since the binding are already looser when it’s hot. Graham Cross also sees great ways to use this new property of graphene. He thinks the ribbons can be used in transistors, which are tiny switches controlled by electricity, and other electronics. But the problem is that it is quite difficult to influence how the ribbons form. This makes James Tour, an expert in nanotechnology, sceptical about the discovery. Boris Yakobson on the other hand, is thrilled by the new discovery, and he already has a plan on how to control the shape of the ribbons by poking even more holes in the graphene. 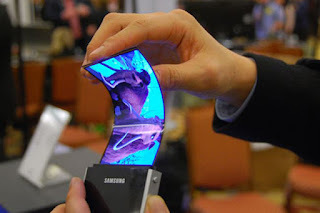 So maybe you’ll have a bendable smartphone in your pocket in ten or twenty years, filled with graphene ribbons.